Measure cord around your wrist, cut and tie two knots on one end. Add beads, and I also added little spacer reads (optional) because we had some here at home and I like the look. Tie a few finishing knots. Add Young Living Essential Oils* – you could either add a drop directly to the lava stone (on 2-3 beads is plenty!) or use a cotton swab or a Q-tip to avoid oils from dripping off beads. *Be sure to dilute oils if needed (you can use a carrier oil such as fractioned coconut oil). Chase put Valor and Stress Away on his. He struggles when he’s in a large group of people, so on school days especially he wears this and smell Valor whenever he needs too. Shailo wanted Valor on his as well :) I also added Stress Away to maaaaybe help him calm down just a tad. I added Stress Away to mine and LOVE it. But you can add whatever one you’d like! Happy FRIYAY (as the cool kids say)! 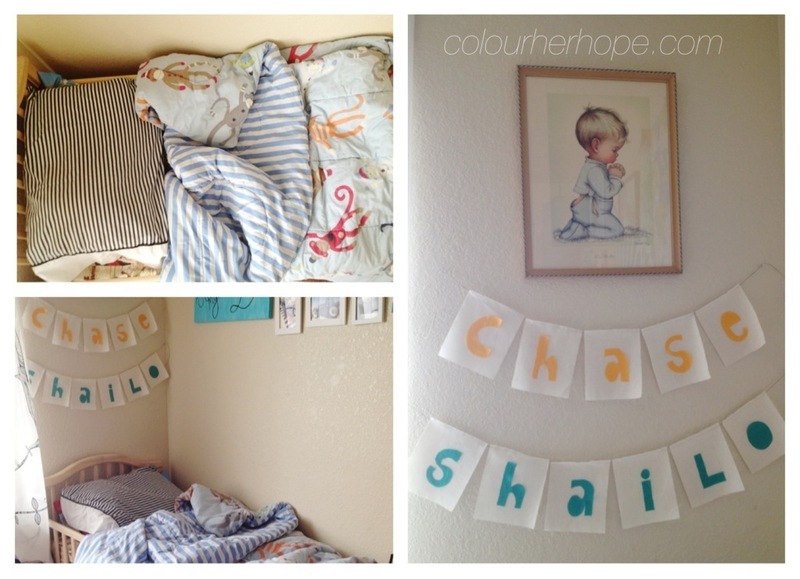 Find me @colourherhopeessentials for more details and great ideas! Chase did a dragon breathing fire. Love these crazy, fun kids! I cannot believe this beautiful blue eyed boy is THREE. Our Shai is a bug-lovin’ boy! So we planned a bug party for this amazing little guy! There weren’t a lot of DIYs for this party, it was the EASIEST party to plan and do and also one of the funnest! I used a cloud bed sheet as a backdrop and added pictures and shared some stats from his actual birth day. It was a dirty, messy, super fun birthday that I recommend to any momma with a boy or girl who loves bugs! LOVE THIS AMAZING LITTLE WILD AND CRAZY BOY! Here’s to many more bug catchin’ years with you, Shai! 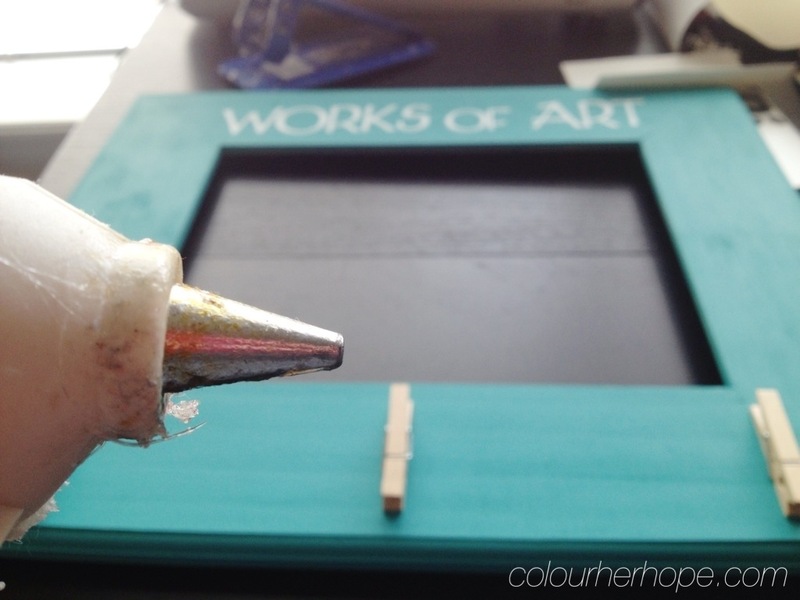 Decided to try and pop out another quick DIY on the blog, before I “pop out” this baby FRIDAY!! Here is a quick post to share DIY headbands for yourself or your little one! Once you’ve cut… Fold it and pin the RIGHT side IN! Then sew, sew, sew. Once you’re finished, fold it again. Cut the corners off, to make the “bow” a little more defined. Cut the extra off the sides if needed (also, for this tutorial I accidentally used a straight stitch when I usually do a close zigzag stitch) Turn material right side out. Knot the material to your liking!! And you’re done! They are so easy and quick and cute! I hope you enjoy this DIY! The next time you see me on here, I’ll be introducing our new bundle!! Pray for us this Friday as we’re having her via C-section around 7:30am MST! For Christmas I was gifted a infinity scarf nursing cover! It’s SO cute and really a brilliant idea, especially if – like me – you love infinity scarves. However, I did not love the price when I heard of it. You can spend a small fortune on one or you could make 5 for the price of 1 you’d buy on Etsy (or elsewhere). I flipped mine inside out and couldn’t believe how easy it would be to make some. This week I ventured to Joann Fabrics and chose 5 prints I loved (currently 30% off!) and began trying my hand at them. Step 1: Pick out cute prints that you can wear with your everyday outfits. I recommend buying a yard of each but you read below (step 3) and decide for yourself. Step 2: Fold your material inside out so the right side is facing each other and pin along the raw edge. The nursing cover I have measured 30″ wide x 20″ long. It fits and will work for nursing, however I wanted to make mine a little bigger. I made 5 and 3 of them are 30″ x 24″ (because I ended up really liking that size personally. And 2 are 60″ wide x 30″ long, and they too are good, just personally I think a little on the bulky and large side. The choice is yours, really! Step 4: (not pictured) sew the raw edge together. This one above has a kind of subtle sparkle in it, I love it! It’s my “dressier” one. This one above is fun because it’s reversible. A simple, pretty print for everyday. I hope this DIY was helpful and made sense. I’m by NO means a professional or even advanced sewer, but I do enjoy sewing and figuring out how to make things that are pretty. Thanks for popping by! I hope to post another DIY soon on baby or adult jersey knot headbands! The invites were pretty simple as I knew there would be a lot going out. I painted the A and C stamps with a cream paint and used washi tape for a simple touch on the front. I also used the washi tape as simple decor on recycled glass jars – which you’ll see later. I chose a few fun fonts and created the invite in Photoshop and then printed them onto a textured teal paper. 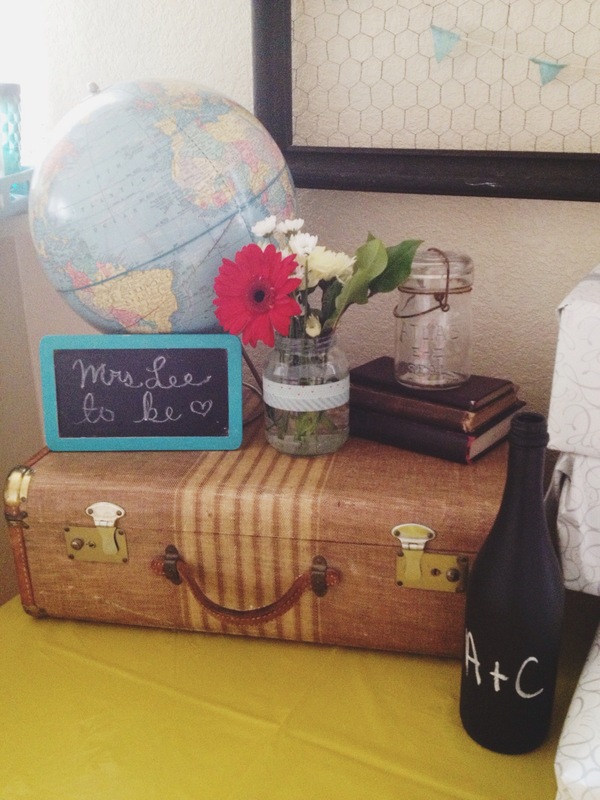 The theme of the shower was Mrs. Lee to be with travel and vintage touches strung throughout my house. A few fun touches greeted the guests as they walked up. I wanted to do some sort of guestbook of encouragement. I first thought letters from her friends but the day before the party I spotted this canvas bag at Hobby Lobby and thought we could have a similar feel on a canvas bag that she could use the weekend or perhaps on her honeymoon! I put a purple fabric marker beside the bag and friends wrote encouraging words to her. I will also use it at her Lingerie Shower for guests who were unable to attend the Wedding Shower. Chey and Anthony are having a travel themed ceremony and she gave me free reign in helping her decorate for her wedding which is a dream! I spotted these amazing old trunks (with old school maps on them!) at a thrift store. A perk: only $25 for both! Beverage station. Simply washi tape on a recycled jar – to holding straws I bought at Bed, Bath and Beyond for $5 (for 144! A great deal, way better than 25 at Hobby Lobby for $4!) 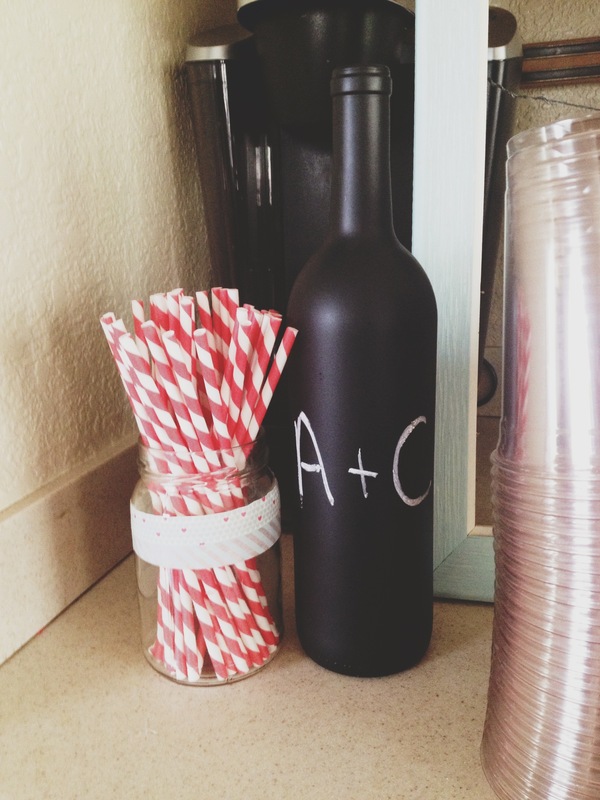 I also made chalkboard wine bottles – which Chey requested as decor for her ceremony! It’s super fun that many of the pieces we’re creating will work at her showers as well as her big day! The frame I already had (I had painted blue for our bed room). It has a small wire I attached to the back and mini clothes pins to hold the photo of the lovely couple! Above: my favourite pinterest inspired piece EVER. An embroidery hoop photo chandelier where I displayed photos from their engagement shoot. I asked Chey and Anthony a list of the same questions and then wrote down one of their answers with a game of He Said, She Said -with props my mom and I made! Guests held up their guesses and Chey held up lips or a mustache to show who said it! Super fun. The funniest game by far was having her guests “help” write her vows – mad lib style! The room broke in to many teams of 2 and worked together (without reading the entire letter) and then they shared the vows at the end. Chey chose which was her favourite. This game had everyone laughing! The winners received a chocolate bar of their choice. I chose this particular brand because it looks like a letter which was a fun addition to the theme. I didn’t get a very good photo of the whole group, but here is one of everyone writing their mad lib vows. What a fun time celebrating my dear, sweet friend Chey! She has been there through so much in my family’s life and is always there to help us in any way she can! It was truly an JOY to finally do something special for her and throw a party celebrating them! I know Chey would say that her favourite gift of the weekend was having her momma fly in for her Wedding Shower (shown above)! Speaking of moms… I couldn’t have thrown this party without the help of my WONDERFUL Madre!! She helped me so much with the cleaning and food prep! Such a blessing. Thanks for popping by. Can’t wait to share more of my beautiful friend’s big day!! And then my sister’s wedding in August!! As far as I can remember, this year was our first time dyeing Easter eggs as a family. Ted rarely has Saturdays off, but recently he has been given a few weekends with us. A fun blessing! Saturday, before Easter Sunday, we decided to try our hands at dyeing eggs with the boys. It had been years since either of us had. We dyed some and then wrote on some with colourful sharpies. Definitely doing this again next year. Maybe branch out and be a little more creative? Pinterest was EXPLODING with ideas! 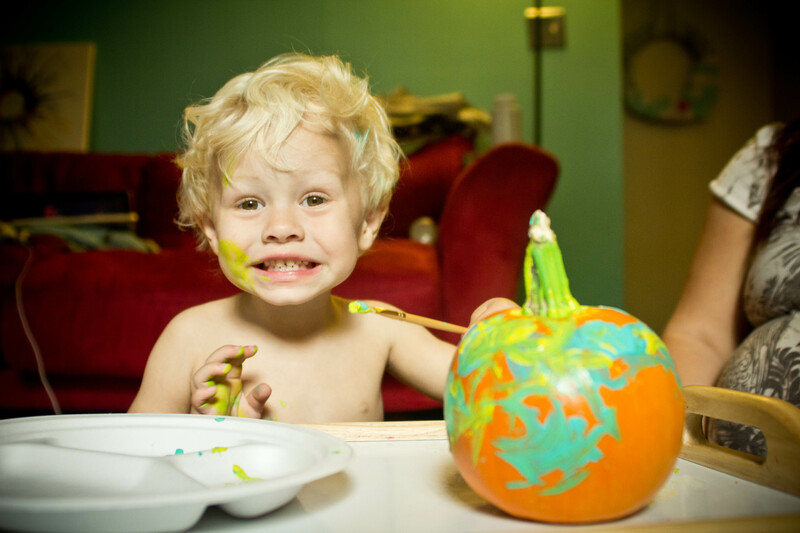 What kinds of ways did you decorate eggs this year?! I would love to hear! 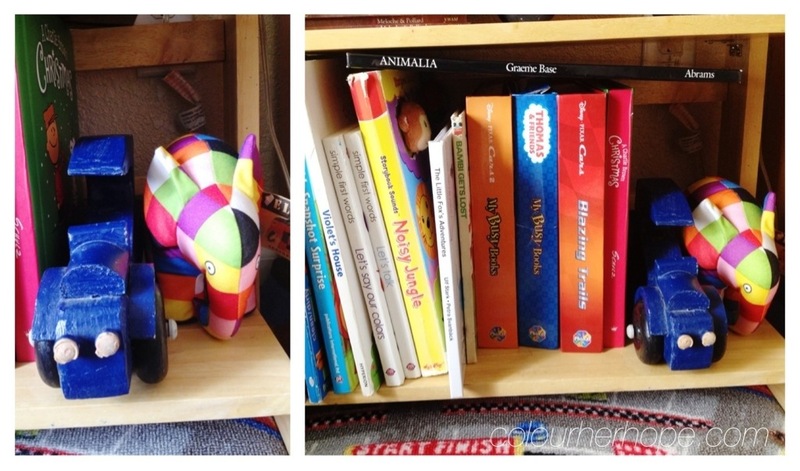 Welcome to the full room tour of the boys’ super colourful-artsy-vintage bedroom/playroom ! This room is a collection of thrifted + gifted items from over the years (the most expensive thing I paid for was the $20 orange rug from IKEA – that’s really not a bragging point, but just to say, I’m a cheap-o and also, to hopefully encourage thrifting, because I know it works! ) I started collecting vintage toys since before we were pregnant with Chase. It has always been a small dream of mine to do a vintage inspired bedroom/playroom – if we are ever blessed with another girl I think this dream will come into fruition even more so! As you enter your eyes might be a tad overwhelmed ;) It is a bit of a colour explosion. Chase spotted this rug at IKEA. $20 for a decent sized rug, not bad! We previously had a CARS blanket laid down for the wear and tear my boys put carpet through. Since we always rent – this rug was a nice find! It will help be a catch all for the little messes little hands can quickly make :) You might remember the room tour from our previous home. I had a very specific colour pallete – which is mainly the colours you see on the 5 canvases above. Well, that all flew out the window with this room. But I have to say, I LOVE where it went; Colour galore. I hung an outfit both boys wore when they were infants. I also framed one of Chaseyboy’s first toys – it was well loved as you can see ;) The cars prints are from IKEA as well as the white frames. The ‘love’ Chase painted a while back. 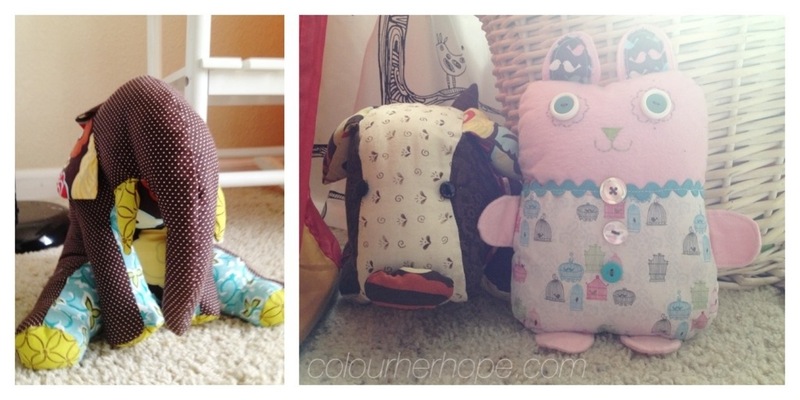 On top of the changing table: a cute pillow friend my mom made Chase two Christmases ago. 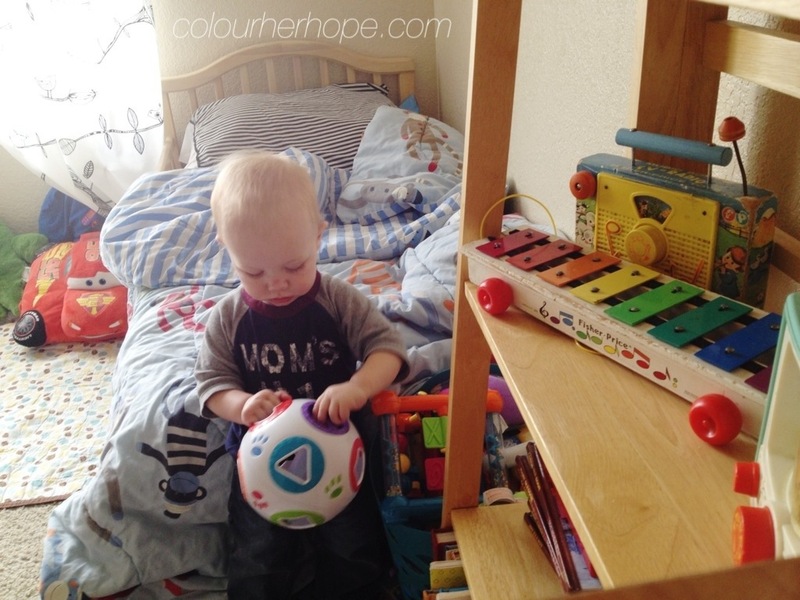 I also put their basket of musical toys up high for special times when my ears can handle the banging symbols ;) We’ve barely used the changing table for what it is really for – to change kiddos. We mostly have used it for storage. I thrifted the baskets that hold Shailo’s jammies and paints/comfy clothes. The bottom drawer holds the awkward sized toys that can’t fit into bins very well. Some art I made for the boys room with a few quotes I love. The pendant banner is made of felt + string. It was decor I made for Shailo’s 1st birthday party. Clouds + Shailo’s 1st year painting! Didn’t his turn out super cute?! I absolutely LOVED these curtains from the moment I saw them in an IKEA catalog. They were a whopping $15. Notice, I didn’t actually hang them with a rod. I just simply hung them with pins! They have yet to be torn down and they’ve been up for months now. The boys cozy spot of the room. Side note: The boys room has the most beautiful natural light all. day. long. We all enjoy being in this room and I think that is a part of it. LOVE natural light. It is a blessing to have both a mother and a mother-in-law who are seriously gifted in sewing. My mom has made these cute little stuffed animals for each of our kiddos! My MIL, Anisa, makes the most amazing quilts and blankets for the boys. This one beneath my feet was one she made right before Chase was born. The basket that holds their stuffed animals (seriously, don’t know how this happened, so many!) This is where Chaseyboy sleeps (you might remember, Shailo sleeps in our room, sometimes in his crib, mostly in our bed ;)) Chase has never had a beloved stuffed animal that he just can’t sleep without but this pillow case is his ‘must have’. Thankfully I have 2! The sock monkey blanket I thrifted and it fits for when he moves to a twin bed. The name banners I made with scrap fabric and twine. And the picture was a gift from my MIL! I spotted a smaller version at an antique mall and she surprised me and mailed this beauty to me. Brought me to tears. LOVE it. Chaseyboy also “can’t sleep” without the “rain” of the white noise maker and his turtle that puts blue stars on his wall at nighttime. Art wall. Love this so very much. From left to right: chalk pastel art by Chase framed in a thrifted, vintage frame, a ‘you are my sunshine’ canvas I painted on Eisley’s due date – for her, next is Chase’s 1st year canvas and some photos you’ll see up close below, next is another You are my sunshine canvas – this one for the boys. This AMAZING piece of art is one my sister, Abie, did. She took a photo of Chase and I and re-created it with, get this, ONLY the words ‘You are my sunshine’ over and over. Isn’t that AMAZING?! Up close of each of the boys’ 1st year canvases. 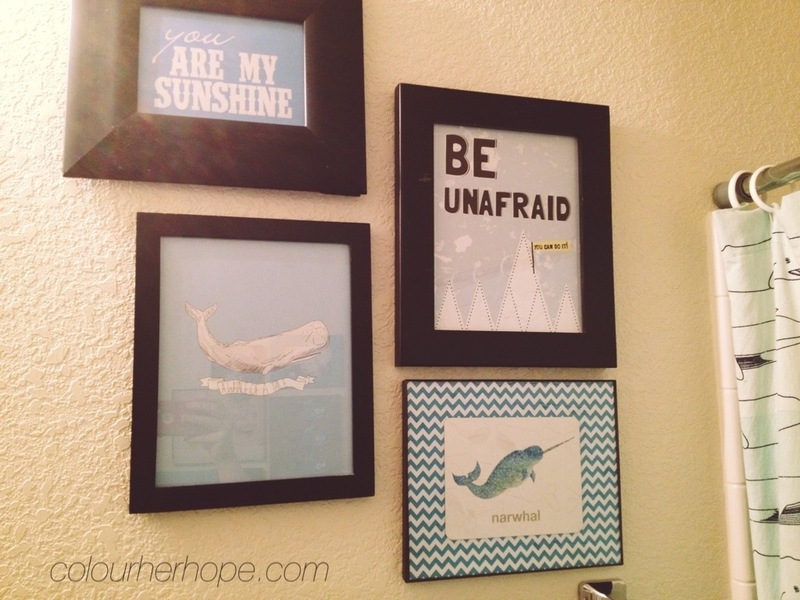 Frames are from IKEA and the far right one is from Target. Photos: Chase and his friend Anthem at our Ugly Sweater Christmas Party, and then one of my FAVES of the boys from this summer – by a tractor, and another of the boys, dressed the same with a similar expression – at the Denver Aquarium. We’ve all seen the crayon art on Pinterest – when it was becoming popular, a mom’s group I was a part of in Fort Collins did it! It was actually a lot of fun, mine of course, was a sun for my “sunshines” :) Below that is Chase’s 3rd year canvas and 2nd year, above that is a small painted frame with an ultrasound photo of Shailo and above that is the quote “every cloud has a silver lining” that I printed offline a few years ago.. Some of the collected vintage toys are able to be displayed (and played with) on their bookcase. The little red, foam car up top was Chase’s very first car! It has now been chewed and torn up but it’s one I just can’t seem to throw away! My MIL often brings us things Ted owned or made as a child. I LOVE THAT. She brought down these heavy wooden cars Ted made when he was little. This blue truck is one of them. This dresser was really nothing special. So I decided to add green and star knobs from Hobby Lobby! The mesh blue hanging organizer I thrifted but found out it is actually from IKEA! It holds dress up things and sometimes toys and stuffed animals – depending on what Chase puts in it. From left to right: The little picture frame which holds the first photo of Chase and Shailo (when he first met his baby brother) was actually made by Ted when he was a kiddo! The other painted frame – Chase and his friend Anthem each painted one before his friend moved away to Georgia recently. It holds a photo of the boys in a tent at their first sleepover! The skateboard I thrifted when Chase was a baby (hope to made skateboard shelving when they are older) and the blocks spell out our boys’ middle names. To the right: close up of the alphabet lamp I thrifted. These little white shoes were Ted’s when he was a baby! Next to it is the Willow Tree ‘brothers’ figure I bought for Christmas and a gum ball machine I added thrifted glass marbles to. The closet is my LEAST favourite spot in this room and you can imagine why :) But I am thankful for this toy organizer. 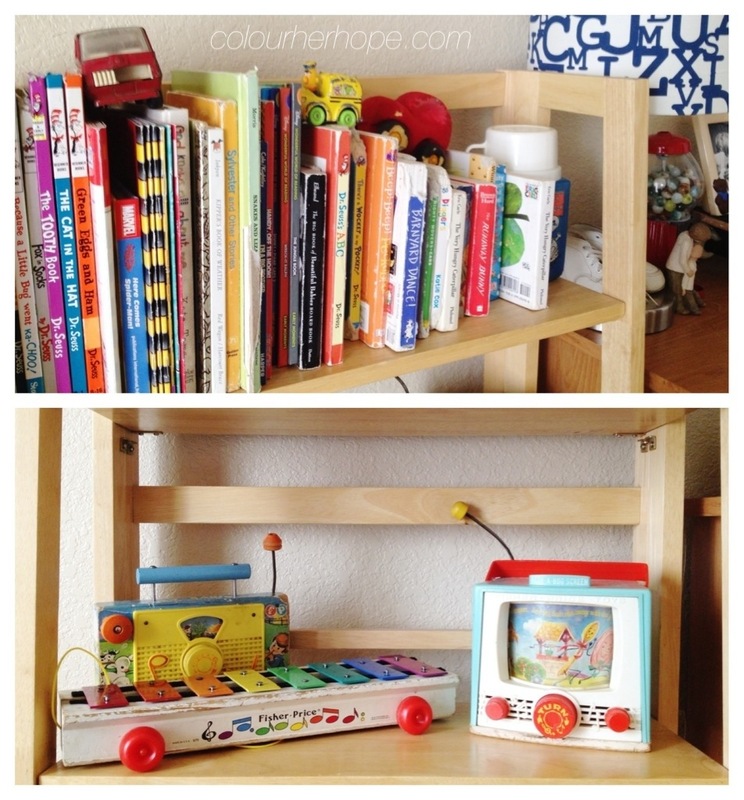 I thrifted both the toy organizer and this vintage shelving! I love the little vintage print with the train and fox. I made this pinterest inspired organizers “for the boys” this Christmas. It has been a HUGE help. I bought the little wooden creatures from Hobby Lobby for around .50-.67 a piece. I painted the wooden door hangers, and used scrap fabric to hang them. The letters are foam stickers. And the ‘months’ was written with a silver sharpie marker. Have a happy Saturday and a wonderful Easter Sunday! The aprons – one was a gift for Chase and we recently painted it. Shailo’s was $1.19 on sale at Hobby Lobby! It is fun to display their art in a place for them to admire or show daddy and friends who come by. When we take down the art – I am so that mom who saves everything but recently started using an app called ArtKive which is amazing! 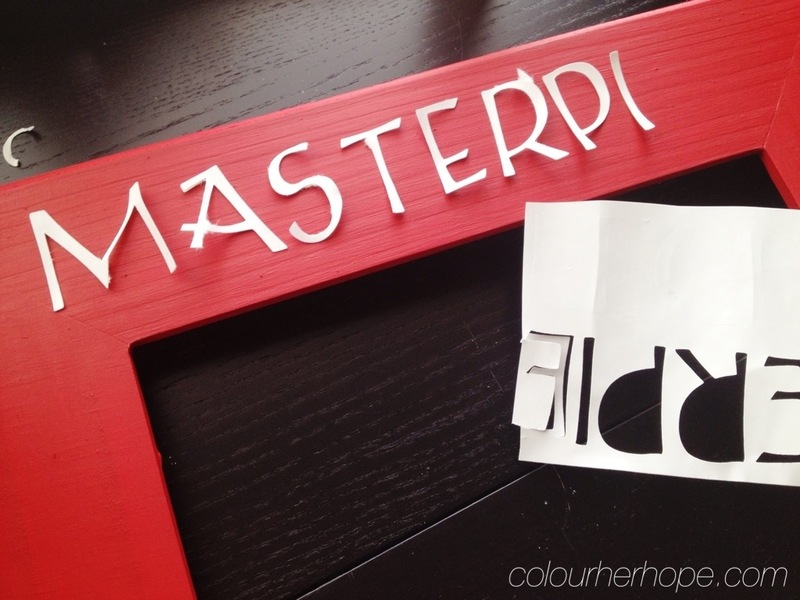 Today’s DIY decor is a piece of art for those who need simple and quick …and a plus, reasonably priced! 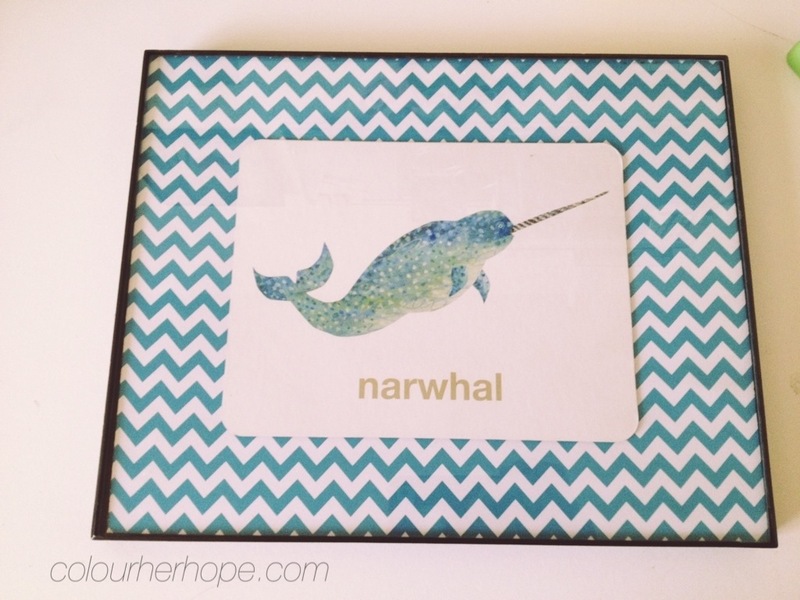 8×10 frame – Wal-Mart Mainstays frame under $2. 4. tape art on 5. hang frame and you’re done! So many possibilities.